pian tubes and ovarian cyst. careful reduction of the urinary bladder from the sac. hernia in a 4 year old boy. had no torsion and no associated genital malformation. sion into the inguinal region. N. O. MACHADO ET AL. reported to have been found in the hernia sac [3,4]. care taken to prevent contamination. ation have long been associated as unusual contents . when it is incarcerated in an indirect inguinal hernia . experienced surgeon because of its surprise element. 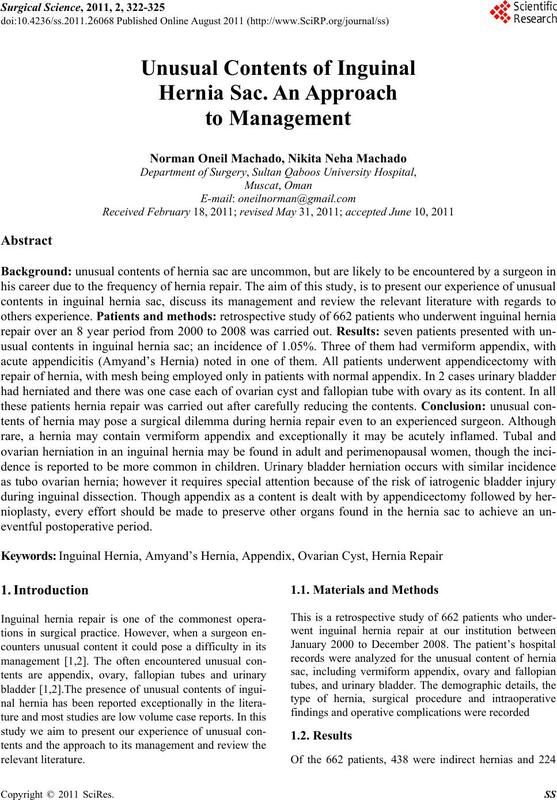 nia Sac,” Hernia, Vol. 10, No. 2, 2006, pp. 152-155. Hippokratia, Vol. 13, No. 3, 2009, pp. 169-171. 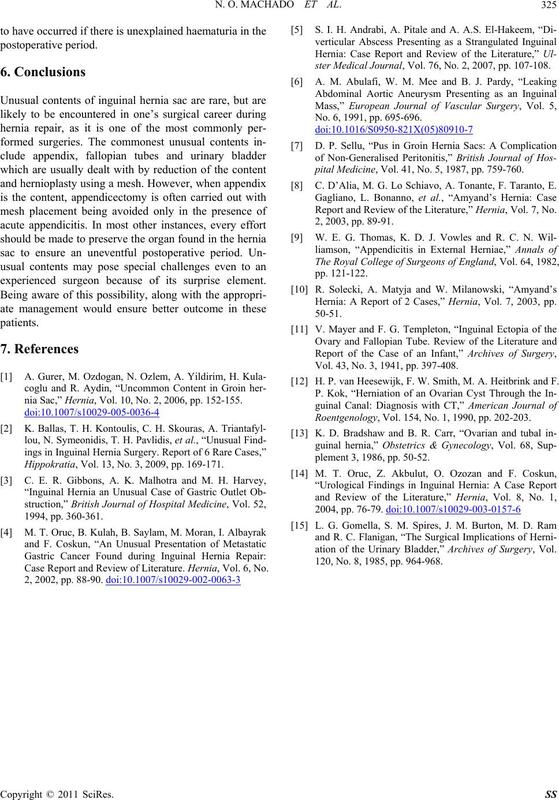 Case Report and Review of Literature. Hernia, Vol. 6, No. ster Medical Journal, Vol. 76, No. 2, 2007, pp. 107-108. No. 6, 1991, pp. 695-696.
pital Medicine, Vol. 41, No. 5, 1987, pp. 759-760. C. D’Alia, M. G. Lo Schiavo, A. Tonante, F. Taranto, E.
Report and Review of the Literature,” Hernia, Vol. 7, No. 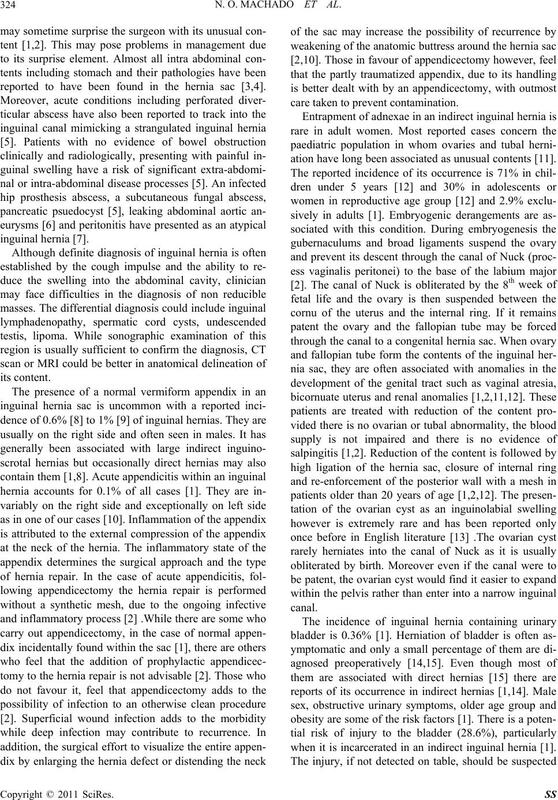 Hernia: A Report of 2 Cases,” Hernia, Vol. 7, 2003, pp. Vol. 43, No. 3, 1941, pp. 397-408. H. P. van Heesewijk, F. W. Smith, M. A. Heitbrink and F.
Roentgenology, Vol. 154, No. 1, 1990, pp. 202-203.
plement 3, 1986, pp. 50-52.
ation of the Urinary Bladder,” Archives of Surgery, Vol. 120, No. 8, 1985, pp. 964-968.